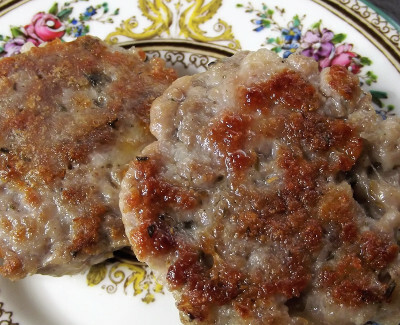 A great basic breakfast sausage without carby fillers or hidden sugar. Can be made hot or mild. Cut the pork and pork fat up into 1 inch cubes. Make sure you avoid the gristle and silverskin as much as possible. Place on a cookie sheet lined with parchment paper. Combine all the spices and sprinkle over the meat and fat. Place in the freezer for 30-40 minutes until meat becomes half frozen. Using a mixer with a grinder attachment, grind the meat and fat together. Meat should come out in strands. If it starts massing up that means that some connective tissue has gotten wrapped around the internal knife. Stop the grinder and clear the knife. If you've made a large batch with the intent of freezing the extra. Chill the sausage covered for a few hours to re-c hill the fat before portioning into 1 or 2 ounce patties. I'd recommend freezing them in a single layer on a baking sheet lined with a silicon mat before bagging them up for long term storage. Note: You can just make this with a pound of ground pork. But it won't have as much great pork fat in it. Play around with the spices. The flavor combinations are endless.